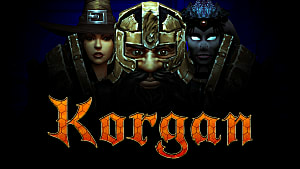 Korgan, on its surface, seems like a very hard game to understand. The novel character-switching mechanic (with each character having their own stats to keep track of, natch), the traps (oh god, the traps), equipment management, and leveling -- it's all pretty overwhelming at first. Plus, the tutorial isn't super helpful. Luckily, the game's systems quickly prove themselves to be much shallower than they appear to be. That's why we've put together this Korgan beginner's guide, to show you that dungeoneering doesn't need to be that hard. In order to successfully navigate the dungeons, first you'll need to familiarize yourself with the three characters you'll be controlling. As you might expect, the warrior is going to function as your tank throughout the episodes, and since health potions are going to be few and far between on your journey, he'll be a character you rely on to soak up the damage. Here's a rundown of his most important abilities. Unlike the other characters, who have a mana or energy bar, the warrior has an armor bar. The tutorial doesn't explain this at all, but as you get hit, you may notice that your health bar doesn't go down. Instead, your armor bar will. The nice thing about this is that the armor bar will replenish over time, so you can soak up some hits, take cover, then rejoin the fray. The warrior's heavy move can be upgraded so that it does splash damage, as well as additional damage to foes that have been frozen by the mage. 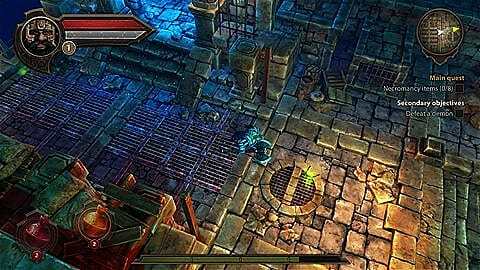 This is key, since early on, you'll have trouble outrunning foes. This makes the earthquake combo very powerful. Invest your upgrade points here early. This is the warrior's special skill. It doubles both damage received and taken, so use it with caution (and preferably a full armor bar). Korgan's mage really only has two abilities you'll need to be aware of, so we'll focus on those two for our Korgan beginner's guide: the iceball and the storm. She's a bit of a glass cannon, so try to only attack from range. Swap if you get swarmed. Also be aware, all of the mage's attacks use mana, so if you're running low, retreat for a bit to regain your stock. As we stated above, this, in combination with the warrior's heavy move, results in an incredibly strong combo, assuming you've unlocked the appropriate upgrade for the warrior. This is an area of effect attack, most useful against a scattered group of enemies. Use it before they notice you, then clean up the scraps. The hunter is without a doubt the most useful character in the game. She is incredibly effective both close-up and at range. Her attacks use energy, which operates the exact same way that mana does for the mage. Because of the way movement works in Korgan, disarming traps is dicey. If you see one (indicated by a red highlighted area), immediately swap to the hunter, and very, VERY slowly tap the joystick towards it. The activation radius for traps is incredibly unforgiving, so take it slow and really inch up on those traps. The hunter's heavy attack unleashes three arrows instead of one, and if you upgrade the hunter's arrow damage, you'll find that this is the most powerful move in the game, especially if you're able to run straight up to a target and hit them with all three arrows at once. Just get out of there before you get clobbered! Korgan's hunter's special attack operates in a similar manner to multi-shot, except even more arrows are loosed. And again, just like the multi-shot, this is incredibly effective up close, especially against some of the tougher baddies you'll come across. 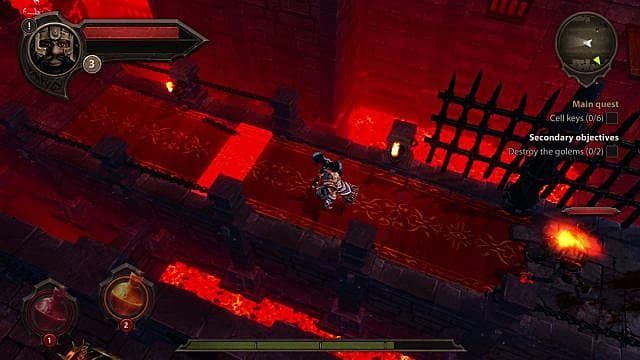 The flow of combat in Korgan generally follows a similar format no matter where in the game you're at, and it mostly has to do with the practice of "kiting" enemies. It takes a bit of time to master this, but in short, "kiting" your enemies refers to getting their attention and then leading them to you in a specific way so that they follow a predictable path and cannot flank or overwhelm you. This is most easily done with the hunter since she's your quickest character. Pop in, draw the attention of an enemy, turn back around to fire, then rinse and repeat. If you get overwhelmed by enemies following you, swap to the mage and fire off a few ice balls to freeze a few. Then, if you're feeling frisky, you can get in there with the warrior, or just keep taking potshots with the hunter. Okay, if we're going to have any kind of authority here in this Korgan beginner's guide, we have to be honest with you. Portals and other enemy spawning points are going to be really annoying. We're sorry. The best way to deal with them that we've found so far is to use the earthquake combo to clear out most, if not all, of the enemies in the area, then swap to the hunter to multi-shot the spawning point. You have been warned, this will take a very long time, and you will be tempted to try to soak up damage with the hunter for as long as you can in order to get in extra shots. DO NOT DO THIS. Health potions are rare, and if you screw up and die, you'll have to do it all over again. Be patient, and you'll get through just fine. First, and most importantly: DO NOT BUY ANYTHING FROM THE MENU STORE. You'll come across merchant NPCs that will sell you things for much, much lower prices than you'll find in the menu. Even if you're in a really tight spot, it is almost always better just to die and make your way back to where you were than it is to blow 1,000 crystals on a measly health potion. Speaking of which, your stock of health potions IS NOT SHARED BETWEEN YOUR CHARACTERS. You will have to keep an eye on each character's stock to avoid running out at an inopportune time. The good news is you can shuffle your potions around, though the way you do that isn't obvious at first. To do that, you'll have to first unequip your health potions from your characters. Then, go to your inventory screen. When you choose to re-equip the health potions on each character, you'll have the chance to select how many to equip to each of them. We recommend leaning heavily towards the hunter and mage since the warrior has his armor. In general, focus your upgrade points on skills that emphasize and increase attack. The penalty for death in Korgan isn't super high -- it's more of a time-waster than anything else -- so it really does pay to turn your motley crew into a group of glass cannons. Specifically, we'd start by putting points into upgrading the freeze rate of the mage's iceball, the attack power of the hunter's arrows, and the warrior's earthquake attack. The dungeons in Korgan can often be unforgiving, but as long as you heed this advice, you'll be raking in golden keys, plundering chests, killing demons, and mastering each successive episode with ease. Stay tuned to GameSkinny for more tips and guides on Korgan, and if you have any strategies you'd like to share, we'd love to hear about them in the comments.